Welcome to our article on the spider guard. In this article, we will explore this truly unique guard; touching a bit on its history and development, exploring some of its main concepts, and look at it in the context of modern Brazilian Jiu-Jitsu and grappling today. Why do we call the spider guard ‘truly unique’? Well, the main reason is that as far as I know, spider guard is a position that exists only in Brazilian Jiu-Jitsu, and nowhere else. Let’s take a look at some of the reasons why. Firstly, it requires the use of the gi jacket, meaning it is not used in other non-jacket grappling sports. Second, the cuff grips that are most commonly used to play the spider guard fall under the category of illegal grips for judo, and in sambo, the kurtka (the gi equivalent) is short-sleeved, and thus the necessary spider guard grips are unavailable. For the above reasons, it was BJJ that developed and refined the spider guard. As to how and when it started, it first started in the late 1980s/early 1990s in Rio de Janeiro as a natural extension and evolution of the open guard. Supposedly, Vinicius ‘Draculinho’ Magalhaes first saw Renzo Grazie using this guard in 1987. According to Mauricio ‘Tinguinha’ Mariano, one of the first well-known successful spider guard players, in the beginning the spider guard was considered a defensive or even stalling position. However, as the position continued to be utilized, more sweeps and submission possibilities were discovered and today, the guard is well-known for both its defensive and offensive capabilities. Grapplers such as Romulo Barral, Michael Langhi, Ruben ‘Cobrinha’ Charles, and most recently, Leandro Lo are all multiple time winners of the World Championships who use spider guard variations as one of their primary guards. What are the main concepts behind this guard and why is it so effective? Basically, spider guard is a ‘long range’ guard as the top grappler is kept at the very end of the guard player’s legs, which means powerful distance control and management, preventing the top grappler from effectively putting his weight on the spider guard player. 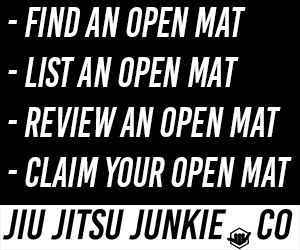 As such, it is a good option for lighter grapplers when going against a significant weight disadvantage. Second, the spider guard grips are notoriously difficult to break, not only due to the power of cuff grips, but also the fact that the top grappler is unable to use his hands to assist with grip breaks as both his sleeves are controlled. The feet in the biceps add to this difficulty. Lastly, the spider guard also allows the guard player to ‘stretch’ out his opponent’s limbs, creating opportunities for attacks such as the omoplata, one of the most common spider guard attacks. Take a look at the videos below for some spider guard concepts. One final note on this guard: be careful of your fingers and spine. Due to the importance of cuff grips in playing this guard, over the long term, excessive use of this guard (and cuff grips in general) can have debilitating effect on your fingers. Further, it is common that the top grappler attacks with aggressive stacking passes when dealing with this guard (see the Michael Langhi highlight above). Hence, it is important that you exercise extra caution when using this guard, particularly if you have spinal issues or a less than flexible neck and spine.